I recently picked up a book by Albert Schweitzer. Fascinated anew, I began getting into his life a little more… Wow! What an accomplished, determined, compassionate person. A sort of late Renaissance Man in breadth of his learning and skills. He sought to be and, for many, in deed (as well as word) became a model for a universal ethic… something which could guide the building of civilization (a key concept in his time and in his scholarly work). This took something of a Christian form for him but was intended as universal. Both born German but neither remained so. Born within roughly 100 miles of each other in areas of borderland or contention. Born within 5 years of each other and died within ten. Both created break-through’s in their specialized fields but also moved and wrote in additional areas with real influence. Both seemed to be consciously aware of the methods of the mind–their own and others’. Both Nobel Prize winners (Einstein – Physics, 1921; Schweitzer – Peace, 1952). Both worked on limiting atomic bomb testing and related peace efforts. Einstein was Jewish and Schweitzer had a Jewish wife and noted father-in-law. First, both sought ways to influence the world for peace. 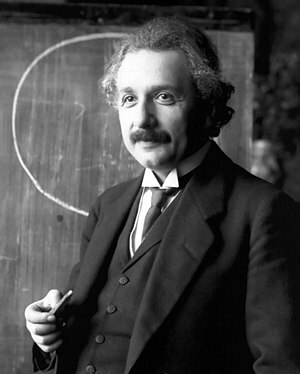 Einstein is reported by biographer, Ronald Clark, to have told his friend, Linus Pauling, a year before his death, that his greatest mistake was to have co-signed a letter of warning to President Roosevelt about the Nazis being at work on an atomic bomb, perhaps the key factor leading to our own Manhattan Project and the use of the first bomb. The rather loosely translated phrase “Reverence for Life” became the title for his ethic and the focus of much of his later writing. Through various efforts, perhaps most noted comprising his medical work and hospital in what is now Gabon, Africa, he sought to spread this building point for civilization. For the philosophy and its concrete application he received the Nobel Peace Prize at age 77. Among those who do know something about Schweitzer, many do not know that he only studied to become a medical doctor in his thirties after high achievements in two other fields, theology and music. He was an accomplished organist who studied and wrote about the music of Bach as well as performed it masterfully. This intertwined with his love of biblical studies and theology, the area of his first doctorate and his classic book, still frequently read and applauded, The Quest of the Historical Jesus (1906 in German, 1910 in English translation). His passion to be a religiously oriented philosopher-scientist continued during his medical studies, and in 1911 he completed his medical dissertation as The Psychiatric Study of Jesus. The following year, at age 37, he married Helene Bresslau, daughter of Jewish historian and professor, Harry Bresslau, who had advocated for German Nationhood which would include full assimilation of German Jews. To understand some of Schweitzer’s priorities, we should note that his early life was spent in a disputed region (Alsace-Lorraine) that was part of the German Empire (annexed, 1871) when he was born in 1875, but it remained heavily French and was granted relative independence in 1911; returned to France in 1918. He lived also in the midst of religious conflicts of theological nature as well as “denominational”, particularly Catholic-Protestant. In addition were the ethnic and religious differences and conflicts between Gentiles and Jews. Was it perhaps this background of early life, diversity of teachers and colleagues, along with his astounding range of talents and high intelligence which drove him to seek the most foundational common ground for humans to pursue life in peace, with mutual respect for one another? Regardless of his source of motivation, he was driven, as described briefly above, to distill his broad learning down to statements like this, “The most immediate fact of man’s consciousness is the assertion ‘I am life that wills to live in the midst of life that wills to live’” (Out of My Life and Thought, autobiography.) One is reminded of an earlier philosopher-scientist’s most basic statement of conscious existence: “I think, therefore I am” (Descartes). I’m sure Schweitzer was quite conversant with Descartes as he was, in-depth, with the slightly later Immanuel Kant. 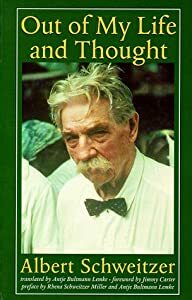 So there is something for almost anyone in the fascinating figure of Albert Schweitzer. (I will, next post, summarize his religious and historical contributions via a powerful, insightful sequel of sorts to his earlier “historical Jesus” work… The Kingdom of God and Primitive Christianity.) Several factors of his life are in near-parallel with his fellow German-born, initially German-speaking genius, Albert Einstein…. Both contributed greatly to the development of civilization and are still able to provide us much-needed guidance toward “reverence for life”! What inspirations, motivations, questions do you have to share here? ← Is Christianity Mainly a Way to Salvation? Thank you for this wonderful message of lives of such dynamic and influential people from the 20th century. I have read Einstein and have noted much you mentioned. As for Schweitzer, I remember growing up with my mom who adapted his reverence for life and espoused the life of Schweitzer. As I look back I was deeply influenced by her love of music and theology and her love of life in all forms, much attributed to him. He was one of her heroes. She was a conduit to me from him. I have sought to contribute to the world around me in a positive way. Your notes and commentary have enlivened in me the need for a more pointed discovery of Schweitzer’s works so that I may pass his philosophy to others in a more efficient and meaningful way. I am absolutely proud to know you and look forward to your future series. I love it! It is what this whole world needs today for sure!!!!! Who Do You Know who Should Be an Expert?? One thing I didn’t mention in the article would probably be of interest to probe some… and read his own comments on (which I haven’t yet): Just if and how much he was “ahead of his time” as to treatment and co-working with indigenous people and the “colonies” or new countries they lived in. He is said to have been (and I read a couple short quotes) anti-colonial in general, and Gabon was still French Equatorial Africa when he started his hospital there…. I don’t know when it became independent, if while he still worked there. But I’ve read that the hospital is still going and large now. Schweitzer was prescient in recognizing our need for a universal code of ethics that transcend the barriers of culture and religion. Indeed he was, and not without a thorough knowledge of the content and history of Christian faith and the Bible, and also of other religions. Which of Schweitzers books should I read first? I actually don’t think I’m in a good position to answer that. I’ve only read his two related ones on historical/biblical studies of Jesus and the Kingdom of God. You can now (as of 3-10) see my review of the 2nd of these (his last-published book… not sure if it was the last written). For most readers who are not into the details of the Jesus/Kingdom studies I’d think maybe his bio, “Out of My Life and Thought” might be most interesting. For those into philosophical and ethical thought, probably his two volume work developing his “Reverence for Life” philosophy and I’m not sure what all else… probably fairly academic, at least at places, as he was a brilliant and widely-read man. If one is interested in Paul, his book, “The Mysticism of Paul the Apostle” might be a good starting place… I’ve not read nor am familiar with that one. The Question As How To Serve… | We dream of things that never were and say: "Why not?"